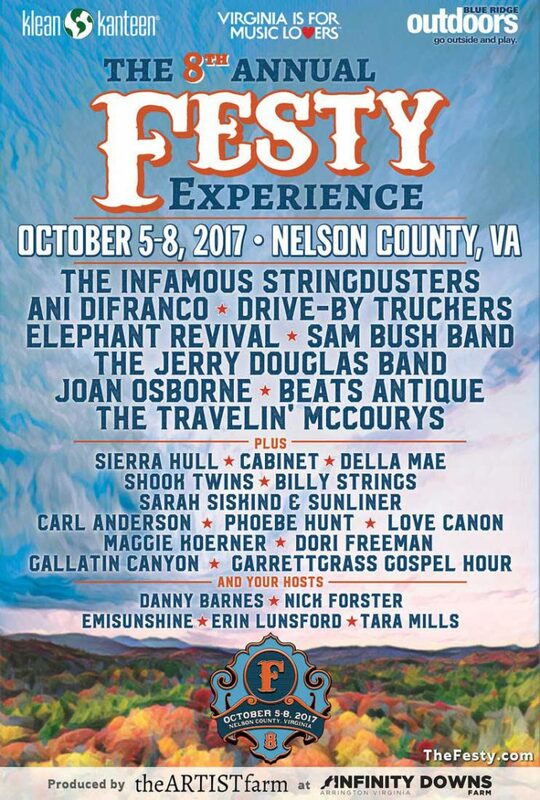 The Festy Experience is excited to announce the second round of its music lineup for the 8th annual festival, happening October 5-8, 2017 in the Blue Ridge Bowl at Infinity Downs Farm in Arrington, Virginia. The lineup comprises a carefully curated blend of national and local roots music acts and additions include Ani DiFranco, Elephant Revival, Beats Antique, Joan Osborne, Sierra Hull, EmiSunshine, Della Mae, Shook Twins, Sarah Siskind & Sunliner, Phoebe Hunt, Maggie Koerner, Dori Freeman, Erin Lunsford, and Tara Mills. Danny Barnes, Nick Forster, and Gallatin Canyon have also been recently added! If you have any questions please contact us at info@theartistfarm.com or 434-220-4000. More information can also be found at www.thefesty.com.